If you’d like to give your child some fun and educational perimeter exercises, this worksheet will be perfect for you. With this math perimeter practice Excel template, all you have to do is put in a number representing the difficulty level you’d like and print it out, and your child will have four different types of perimeter problems to work on, all tailored to his or her skill in adding and multiplying. These easy-to-produce exercises are handy both for the parent and teacher. As a teacher, this makes it easy to gradually increase the difficulty of a series of worksheets for your students, so once they’ve learned the logic needed to perform the perimeter exercises they can move on to do the same types of exercises with bigger numbers. This way, your students receive a visual way to practice their addition and multiplication skills, and you don’t have to design a new perimeter exercise every day. The same process works at home, of course: If you need to give your child some helpful worksheets to get their perimeter-calculating skills up to speed, this lets you increase the challenge gradually without added stress for you. It’s as simple as can be–every time you change the variable at the top of the “Teacher” tab of this worksheet, the “Class” tab has a different blank worksheet, keyed to that specific variable. These worksheets show four different problem types. 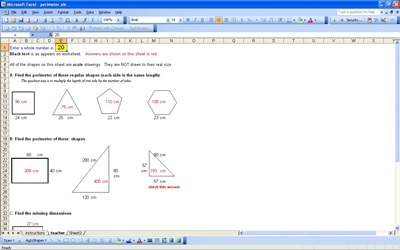 The first two sections ask the student to find the perimeters of either regular or irregular shapes. In the third, they figure out the length of a single side of a regular shape based on its perimeter. Finally, the worksheet asks the child to find the perimeter of a very oddly-shaped playground.